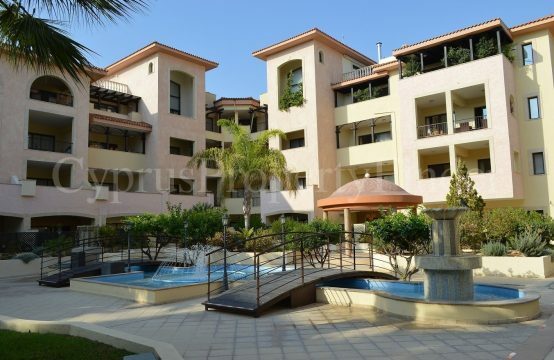 A Two Bedroom Two Bathroom Ground Floor Apartment in Universal Area of Paphos. The Apartment benefits from a Large Private Covered/Uncovered Veranda with Private Patio Garden and direct access to the Communal Swimming Pool. This Apartment forms part of an Established Development of 19 apartments with Communal Swimming Pool. It is Excellently located on a quiet yet central residential area within a five minutes drive to the sandy beaches and within walking distance to many amenities. The main entrance leads into a hallway and the Kitchen is in front of you. The Kitchen is well equipped with wall and base units and white goods and separated from the Dining Area by a breakfast bar. The Open Plan Living/Dining Area is bright and spacious and has a door that leads to the Large Private Veranda overlooking the communal swimming pool. The hallway off the Living area leads to the Double Bedroom and a Family Bathroom. The Bedroom has Fitted Wardrobes and sliding patio doors that leads to the Large Veranda. The Second Bedroom with bathroom and fitted wardrobes has private access from the veranda. The property has Air Conditioning throughout and Ceiling Fans in the Kitchen and Veranda. There are Fly Screens and Shutters. There is also an Allocated Covered Parking Space on the lower level with an Elevator. All Furniture and White Goods are included in the sale price. This Lovely Property is ideal for holiday use and as rental investment!